You are here: Home / Africa / Ethiopia / Wandering Castles & Palaces Thinking Donkeys. Again. While I love riding and experiencing through all my senses the sights, smells, changes in geography, geology, architecture, faces, landscapes and more when riding my motorcycle, perhaps the most fun is off the bike and walking through these small towns and villages. The good thing is that they’re usually small enough that hoofing it is easy and doesn’t impact time nor energy. But even more, without the burden of motorcycle gear and the apparel such as boots, heavy jackets and pants and the encumbrances that go along, one can better enjoy and immerse in the culture and the place. Don’t get me wrong, there’s no better way for traveling and seeing the world if you’ve got the time aren’t afraid of the machine or throwing yourself out there untethered by return tickets, reservations or other schedules. 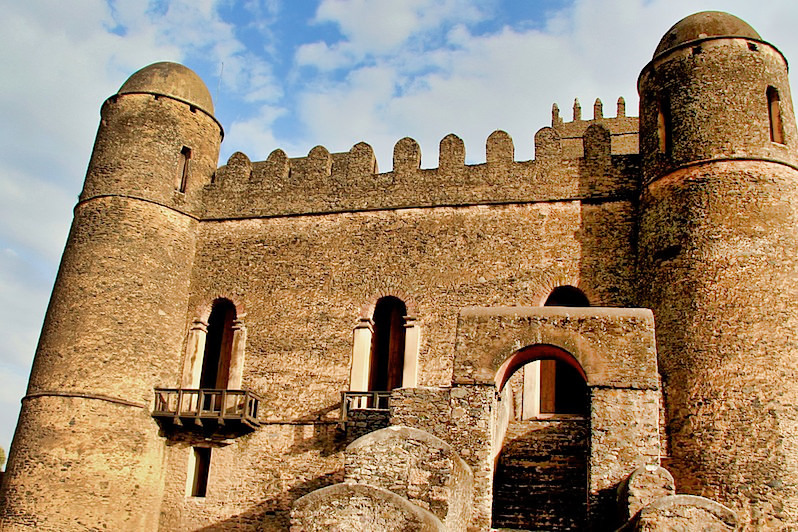 But walking around Gonder to wander around castles, explore palaces built for emperors and waddling through age-old markets, it’s what seduces me into this nomadic journey through places I only dreamed of or never thought I’d see. And then to wake up, ride the bike to the next place and do it all over again. This is no weekend getaway nor two week hiatus from work. No. This is my work and this is what I love. I get paid by the smiles in the faces I meet, in the history I learn and in the faith in humanity that is reinforced over and over again. Today I tried to buy a donkey. You might think I’m a bit crazy. But the donkeys here in Ethiopia have an alluring look and in parts considered holy from a biblical sense. Though the way that I see them sometimes treated make me wonder. They’ve earned my respect and they’re the hardest non-conditional (albeit some grass now and then) workers I’ve met along my journey. A youngster would cost me about USD $70. But when the donkey seller and I tried to figure how I’d get him on the back of Doc, we were both left scratching our heads. Then, as another local was quick to point out, there would be problems crossing the border into Sudan with the additional passenger. “A visa?” I asked jokingly. No there are strict laws and cultural norms that deal with trading livestock. And now wasn’t the time to learn about that. Instead, I got wrapped up and lost in the Royal Enclosure that houses Emperor Fasilades’ Palace and the Palace of Iyasu – the greatest ruler of Ethiopia’s colorful Gonderine period. The Gonder Donkey Kingpin. AT $70 it was a temptation for me. But where do I put a donkey, even a small one, on Doc? I opted to price a younger more youthful donkey. Another donkey dude would sell any of these, too. 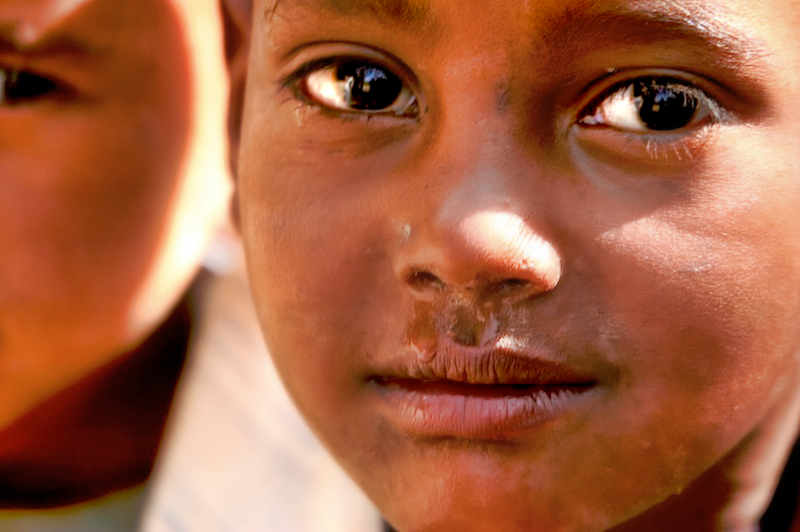 Faces tell a thousand stories. To understand Gonder and its importance and then fall in Ethiopian history is beyond the scope of my report from this enchanting town. To be sure, in this part of Ethiopia we find relics and records of Christianity, which according to some reached Ethiopia at the time of the Apostles. Keep in mind, that the week or so I spent in Addis I was amazed that like the Mosques I’ve seen from Uganda to Indonesia all with powerful sound systems and speakers pointing in every direction, I found Christian churches in unique grand design not unlike the shiny mosques of Islam, and also fitted with speakers where daily prayers are recited and sung by monks and priests. No where else have I ever seen churches broadcasting prayers over loudspeakers. It in Aksum, one of the most powerful ancient kingdoms just north of here where Christianity first arrived in Ethiopia followed hundreds of years later by Islam in the 7th or 8th century. Today the religions coexist peacefully and seemingly without conflict. 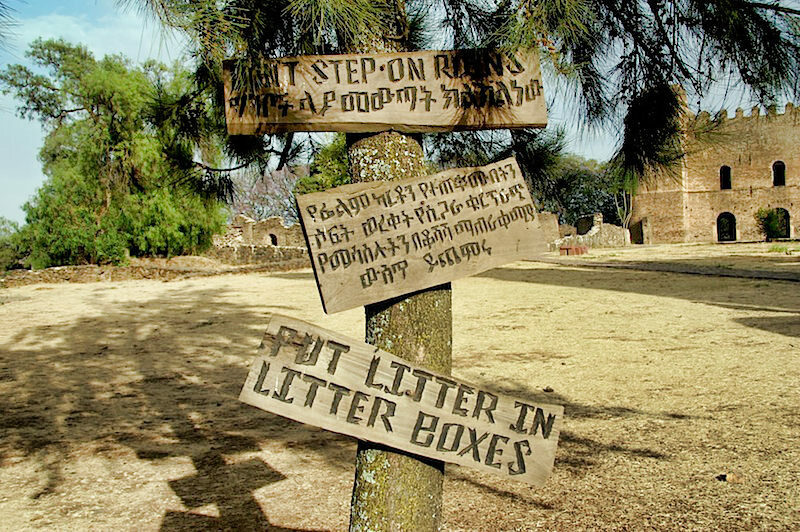 This is the first time in Ethiopia I’ve seen a “litter” sign – BRAVO! So back to the Palaces and Castles. I recruited the aid of a well spoken and educated guide and perhaps due to my luck or the lack of people touristing this part of Ethiopia I had the entire enclosure and guide almost to myself. A young couple meandering the grounds with their head buried in a guide book popped up now and then. 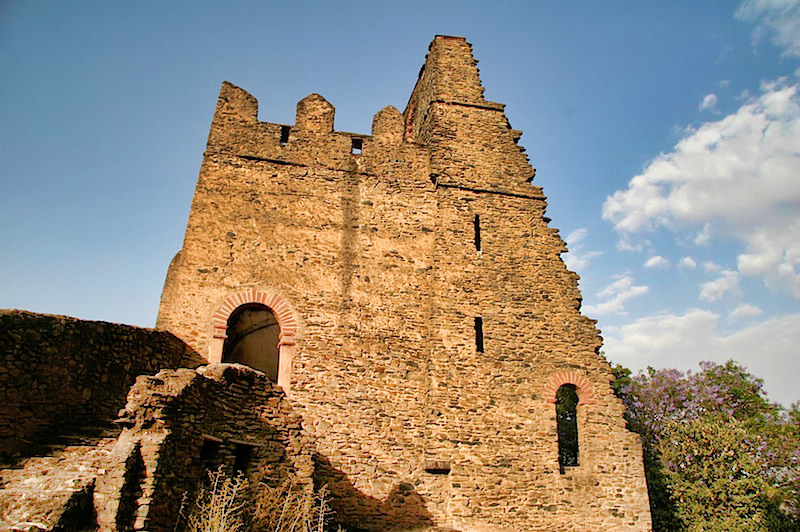 The Royal Enclosure dominates central Gonder with its high stone walls, and towering castles is also known as Fasil Ghebbi, a UNESCO Heritage Site since 1979. Walking around this enclosure I need to remind myself I’m in Ethiopia and not Italy or France wandering some medieval village. Most impressive is Fasilades’ Palace, the oldest and tallest of the structures in the enclosure it’s punctuated by a parapet and four domed towers and according to my guide it is said to been designed by an Indian architect and incorporates influences from Indian, Moors and Portuguese designs. In the main dining hall a Star of David is an indication of Fasilades relationship to the Solomonic dynasty. So impressive is the design that it included a cistern with a water distribution system throughout the complex carved in stone. Thanks to UNESCO the building is wonderfully restored and in some places features original beamed ceilings and untarnished frescoes. 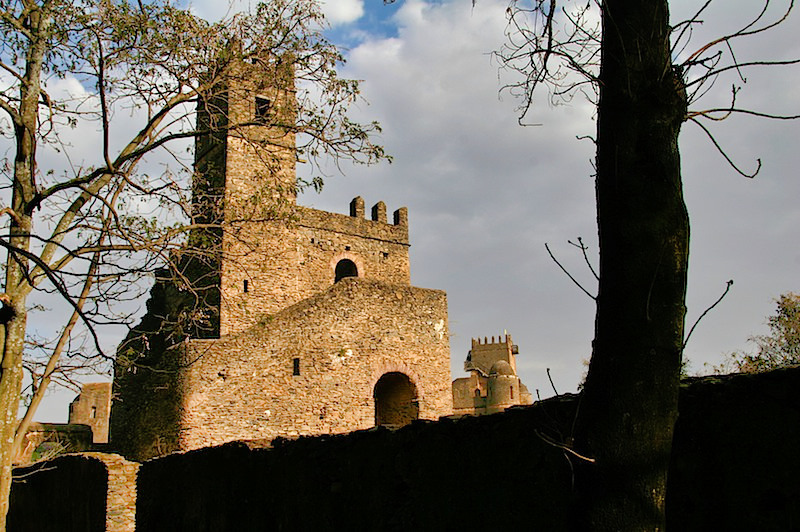 This is amazing because during the fall of Gonder in the mid-1800’s, the country fell back into the dark ages and the town was torn between a civil war, hostile visitors from Sudan and others eager to basque in the regions once great riches. Elsewhere in the enclosure is a second palace build by Iyasu I. With vaulted ceilings and hints of its former grandeur, the palace didn’t survive both a massive earthquake in 1704 nor British bombing around World War II. Also on the palace are two Lion Houses, one built by Halai Selassie and until 1992 some of his lions were kept there, though the ex-emperor died in the late 1970’s. 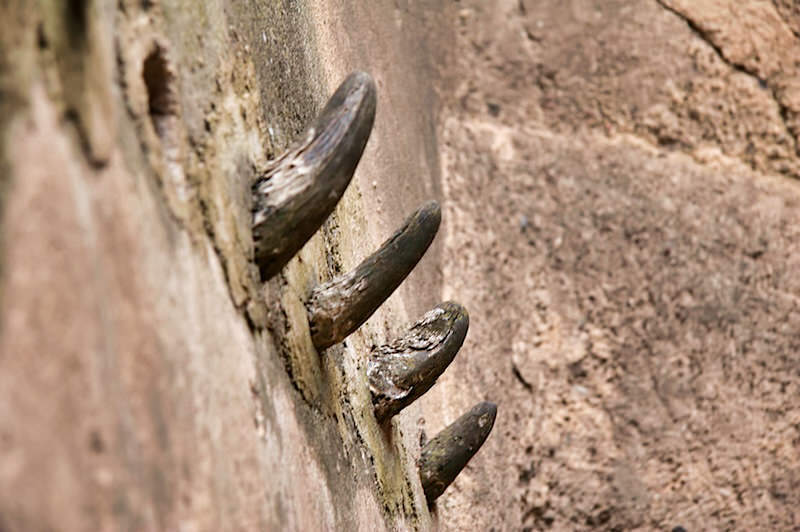 Also in the building are Turkish baths where some of the original hooks made from cow horns are still affixed to the walls, and a fire pit used to heat water to create the steam is at one end of the baths. 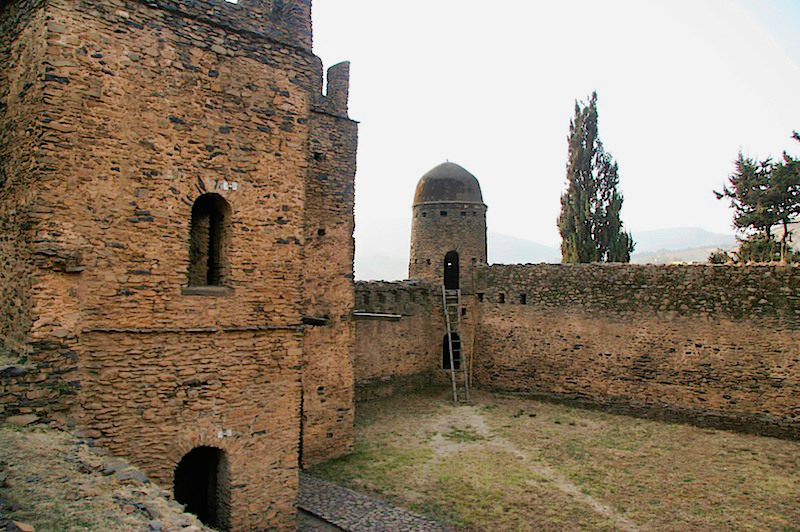 Finally a third castle in the Enclosure is Menteweb’s Castle, a more subtle two story complex that houses a heritage center and a small shop where traditional handicrafts made in Gonder and nearby villages are on display and available for sale. I was impressed by the textile work, but sadly I just don’t have space for souvenirs. After leaving the complex my guide took me to Fasilades’ Bath, also under UNESCO’s World Heritage Site the bath is currently in the final throws of restoration, but it’s massive and impressive. Even the tree roots which are nearly overtaking the stone roll surrounding the sunken pool and small adjacent building are a site to see. 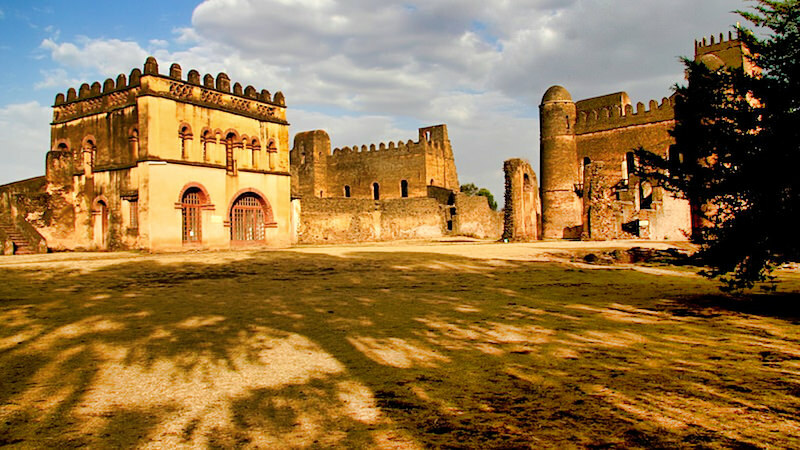 The Royal Enclosure at Gonder, Ethiopia. I also wondered the town and visited the local post office in search of a DHL office. Turns out there’s no DHL, FedEx nor UPS office in this town. 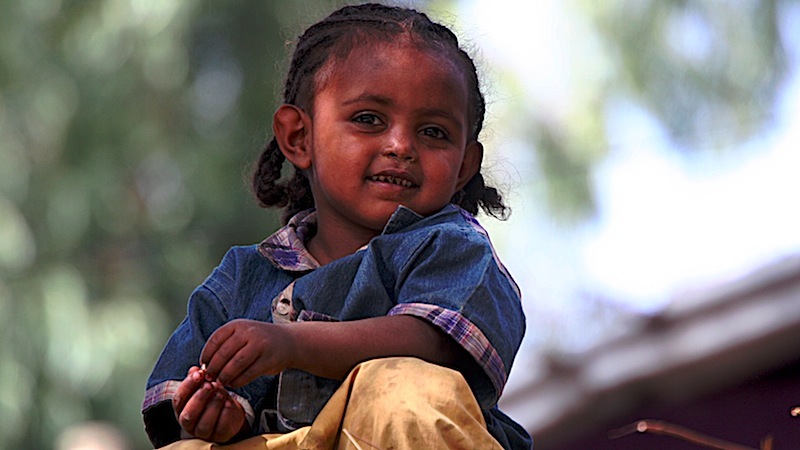 A phone call to DHL in Addis turned out to be another lesson in frustration and patience. My tire is still in Addis awaiting direction from me. For fear that something might happen and with only a 7-day transit visa for Sudan, I made the decision to have DHL simply send the tire to Cairo, though it’ll probably be more than a month until I get there. My rear tire is still holding up so no urgent need here. The fork seals? We’ll see what happens when I get to Khartoum. There’s no way I won’t to embark on that project here in Gonder. Tomorrow I’ll take a couple day trip to Lalibela, another UNESCO World Heritage Site and supposedly the “Petra” of Africa. But I’ll visit this historical site without a new donkey. Oh well. 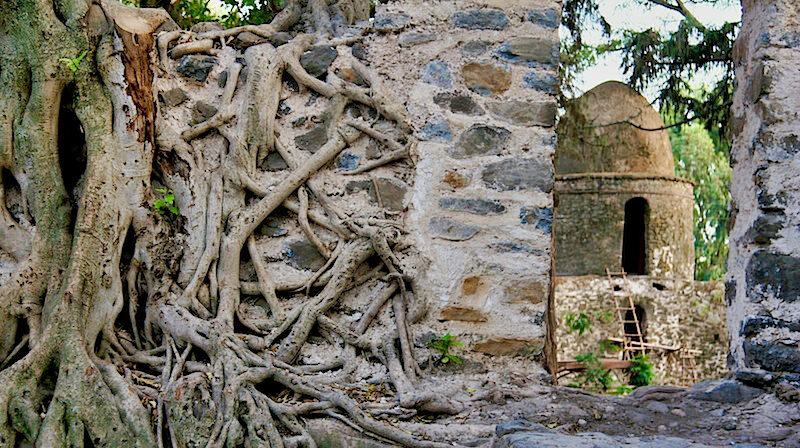 The roots of trees take over the walls at Fasilades Baths and Private Residence in Gonder, Ethiopia. 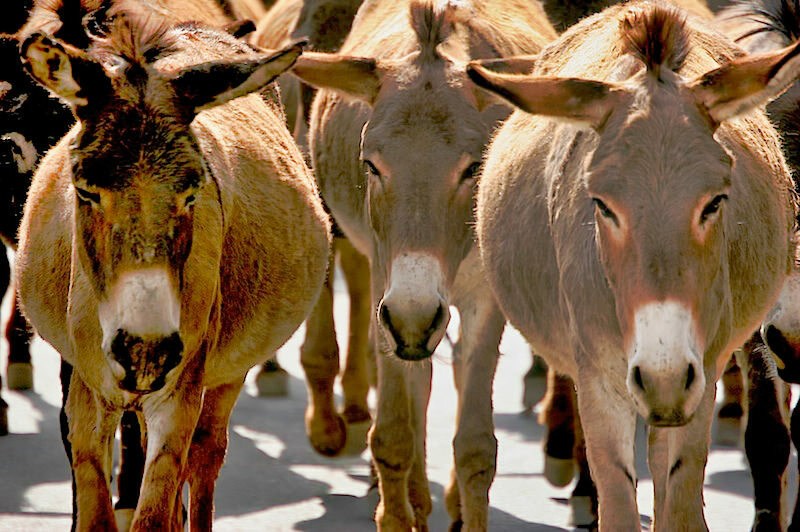 On the day when you tried to buy a donkey ….. you also approached an irish pharmacist (me) asking “Hey, you guys got any analgesia?”. anyway,,,where in the world are you now… middle east yet? 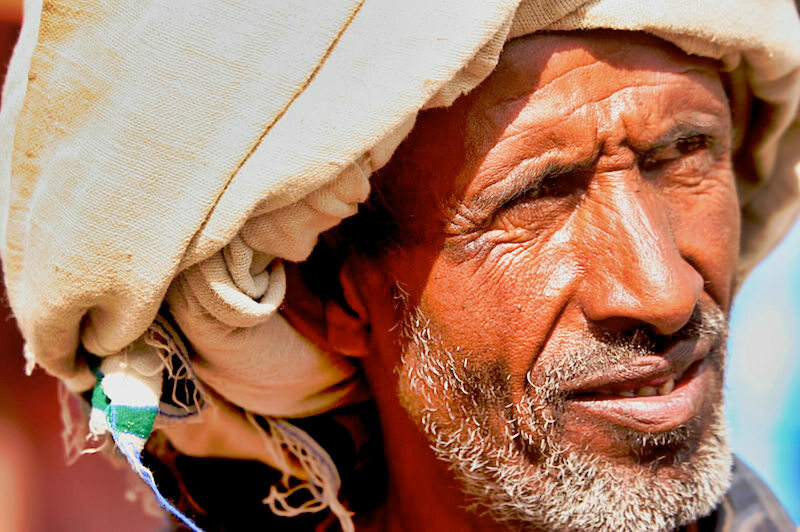 Staring At The Faces of 104 Angels – After A Lonely Ride To Gonder If They Build It, They Will Come. The Amazing Churches of Lalibela.